I wouldn't normally be thinking about George Orwell first thing in the morning, but these days it seems that it's all Orwell, all the time. Last Tuesday morning it started for me with Bryan Dobson on Morning Ireland, doing an item about the Euromillions winner. It was a big item too, reflecting the fact that €175m is a big amount of money. But there would have been other items too, such as the possible destruction of our civilisation by the forces of the No-Deal far right, which have a certain bigness about them. There are Euromillions of another kind in that one. Yet there was Dobbo doing the lottery story in the prime location on the show, the first item after the eight o'clock news. Which made me think of this line in Orwell's 1984: "The Lottery, with its weekly payout of enormous prizes, was the one public event to which the proles paid serious attention… Winston had nothing to do with the Lottery, which was managed by the Ministry of Plenty, but he was aware (indeed everyone in the party was aware) that the prizes were largely imaginary…"
Now the €175m won by the folks from The Naul and thereabouts is not imaginary, in a technical sense, in the sense that these actual people will receive that actual money. But for anyone who "plays" the lottery, it is all imaginary. For a few moments, you imagine yourself winning, but you also know that you have less chance of getting there than you have of being struck by a bolt of lightning, or of walking away from a plane crash. Or maybe being struck by a bolt of lightning while you are walking away from that plane crash. So one of the least true things that has ever been said, in the world of advertising, is the lottery slogan: It Could Be You. Indeed, it is so much more true to say that: It Couldn't Be You. The lotto-line is one of the least true things that has ever been said not just in the world of advertising, but in the world. Indeed, it might have occurred to Dobbo to put this to the man from the National Lottery while he had him there. But instead they spoke of the ways in which the winners of €175m might react to this new situation, the difference that €175m might make to you, things that affect us all at some stage of our lives - or not, as the case may be. 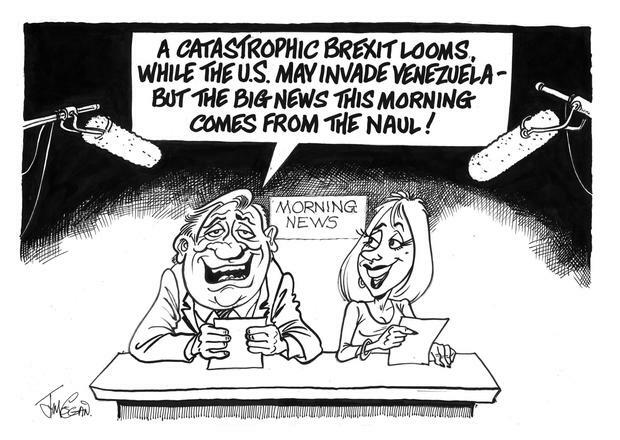 They didn't talk about the advertising, as such, because effectively what was happening in this lead item on Morning Ireland, was itself advertising - which reminded me again, oddly enough, of Orwell, who explained that "news is something that someone, somewhere wants to suppress, the rest is advertising". Indeed, this advertising for the lottery was the lead item on Sean O'Rourke too, and on the RTE TV news. All of it was advertising - though the people who were putting it out didn't seem to know that. Maybe they thought we needed a bit of "good news" to take our minds off the many public events tormenting us - though there's a limited number of people for whom winning €175m really is good news, and soon we knew that it was limited to one family, in The Naul. It was good for them, but it may indeed have been bad for others, who were only being reminded of how broke they are. And you wouldn't need to be George Orwell either to steer the conversation briefly away from the lines approved by the proverbial Ministry of Plenty - there was a report in January about the Lottery Regulator sending underage kids to 510 shops around the country, and finding that 37pc of them were able to buy scratchcards. It might also have been a good time to ask one of these spokespeople to remind us why exactly the Government sold off the lottery when it is still apparently such a success under the excellent terms offered to its new proprietors. And the ease with which gambling corporations can advertise themselves for free, could also be heard on a recent Morning Ireland when 'It Says In The Papers' read out a piece about a chap who won €4.8m for €10 in an online betting game. What a result for the bookies, to supply the copy for that to the newspaper, which runs it like it's not an ad, and it is then broadcast to the multitudes. Really, you'd expect them to know how this works, on 'It Says In The Papers' - I mean, do they not read the papers? Yet it never seems quite right to me, to describe any lottery as gambling. A lot of the pleasure of gambling comes from the idea of having your judgment vindicated. And since there is usually very little judgment involved in picking a few numbers and hoping for the best, it is like gambling with all the good things about gambling taken out. Like Winston Smith, I would have nothing to do with it. So it Could Be You, but it Couldn't Be Me. Though I think it is fair to say, it Won't Be You either. When Richard Keys and Andy Gray were presenting the football on Sky Sports, and they were introducing a game that was even more massive than the other massive, massive games - a game that usually featured Manchester United and Liverpool - Keysy would sometimes turn to Graysy and he would ask him solemnly: "How big is this?" And in tones which were suitably laden with awe, given the gargantuan nature of the event which was about to unfold, Graysy would try to find the language which would somehow contain all the vastness of the occasion, though the line which has stayed with me is one uttered by Keysy himself - he looked straight into the camera, beaming it down the bottle, and he said in a hushed tone: "It's enormous." So mesmerisingly huge was it, in Keysy it had induced this air of humility, this sense of his own smallness in relation to everything that was about to take place - yes he could have used many, many words as he strove to encapsulate the magnitude of what was happening, but so overwhelmed was he by it all, he could find just two words, softly spoken: "It's enormous." Today Man United are playing Liverpool, and such is the enormity of it, even the word "enormous" itself, uttered with profound sincerity by Keysy, would be so far away from conveying the size of this thing, its very inadequacy would be of enormous proportions. 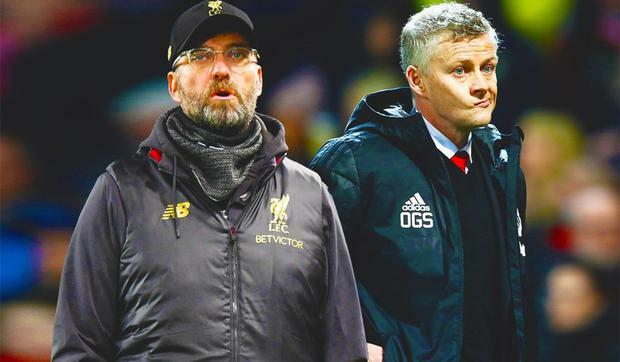 United have the opportunity of damaging Liverpool's chance of winning the league, which is a sign of how far they have fallen, as that used to be Liverpool's big thrill in these games. But did I say "big"? I'm sorry, when two empires meet in this way, to decide what can with some justification be called the future of the human race, "big" can never be in that conversation. "Big" is very small indeed. And I could be here like Keysy trying to nail it for you, trying to beam it down the bottle like he did, those words which might communicate even a hint of the incalculable largeness which we are about to experience this afternoon. But I have to tell you: there are no words. The goodness of Jump Girls, the documentary on TG4 about women who are doing so well in National Hunt racing, did not end with the programme itself - when they announced that this was just the first episode, and that there's a second part on Thursday night, I was perfectly happy to spend another hour with these people and their horses. Which is a rare enough thing, at a time when we are always anxious about persevering with some series, about wasting another hour of our lives. 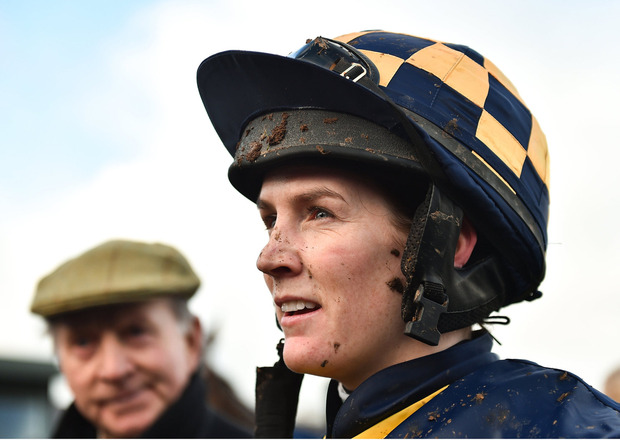 I especially enjoyed the story of how Rachael Blackmore was given her chance by the trainer John Joseph 'Shark' Hanlon, who had seen her taking two falls off terrible horses on the same day at a point-to-point, and was convinced that if she didn't get away from the point-to-points, she'd be killed. He put her on board Stowaway Pearl in a ladies' race in Thurles, and though he fancied the horse, he did not tell her that - indeed, he fancied it so much that it was backed from 20-1 to around 6-1, and when Rachael had it leading by 20 lengths at the second last fence, these thoughts were surely running through the large red head of 'Shark': "Indeed I am pleased that we have gained the upper hand today on the racecourse, but of far more significance is the fact that we have seen another blow being struck against the patriarchy - and not just against the institutionalised discrimination against women which has characterised much of our society to the detriment of all, but against the specific structures of our equestrian world in which women are so deeply involved in the lower echelons, yet have been held back by those same patriarchal values." Now 'Shark' may not have been thinking that exactly, as he "collected", and indeed those were not his exact words to the camera, which went like this: "There was a few quid got, and 'twas a great day." But it is roughly the same thing.